Even though I grow some food in my back yard (just enough to snack, really), I've decided to sign on with a local Community Supported Agriculture (CSA) program through Helsing Farm. For folks that don't know, a CSA is a crop-sharing program; you can pay for shares of a farm's harvest. 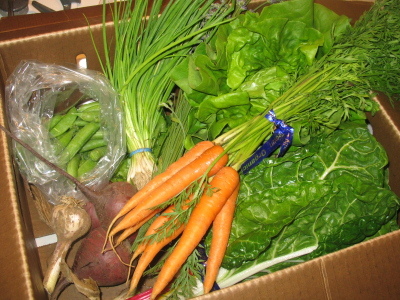 Each week, you get a box full of produce that was pulled out of the ground, and depending on the size of the share you purchase (small or large) you end up with a healthy amount and variety of food. The pricing on the farms around here is about $450 for a small share and $650, and in both cases, you get a box of food every week for 4 months. That comes out to about $25 a week, which is more than I typically pay for vegetables... but I think it'll offset some of the crap that I've been eating -- you can't really go wrong with more vegetables. Because the timing of the harvest makes for different boxes throughout the season, I've decided to keep a weekly log of what I received, to see if I'm really getting my money's worth, and to see what kind of variety I'm getting in my boxes. If nothing else, I'll be able to see that I'm eating all kinds of new things, and I'll know that I'm supporting the local agricultural market. I've wanted to be a part of a CSA for a few years now, but it will have to wait till next year. This year we moved during the end of May when most of the CSA were all filled up, and in previous years I felt like I live too far from the farms to justify it. Most of my free time thinking is devoted to finding ways for people to connect to their local food, so CSA make a whole lot of sense to me. It's true that most people will not see the vegetables they get each week as a "value." However, the value shows itself in knowing where your food is coming from, and with all of the recent FDA warnings about tomatoes, peppers, spinach, etc knowing how your food is grown seems like a better value than price. The other aspect of CSA's that I like is they put people back in their kitchen. Seriously, how many people actually buy beet root from the store? Or chard? As the season unfolds you will find yourself wondering "what am I supposed to do with this?" And that is a beautiful thing, in my book. I hope life is well, blog friend. I'm hoping to put up some new pictures of the garden this weekend. I harvested my first cucumber yesterday. Things are really taking shape. Oh, and I'm in the process of building a potting table. I'll have to put some pictures up of that progress, too. Yeah - I do appreciate knowing where my food is coming from; there's something to be said about being closer to the source. But there's certainly a limit on what kind of premium should be charged for something like that.